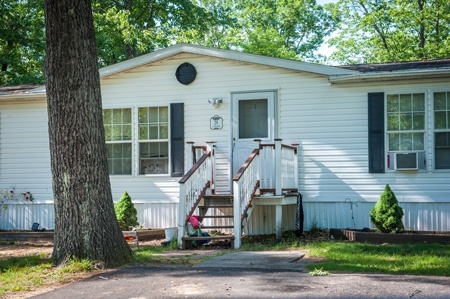 What, exactly, is a manufactured home? Is it a mobile home? Is it a modular home? A trailer? Manufactured homes are not mobile, and definitely can’t be pulled behind your car or pickup truck! Fewer than 1% are ever moved after being installed, at least partly because of the cost—between $6,000 and $10,000. Manufactured homes are nothing like your grandparents’ trailer. Modern manufactured homes are well-designed and constructed. Since 1976, they’ve been built to a quality standard comparable to that of site-built housing, and with a similar life span. Unlike your car, the value of a well-maintained manufactured house should not depreciate as years go by. Manufactured homes are not modular homes, although both are constructed in factories. The key difference is that modular homes need to be placed on a foundation for support. A manufactured home can be installed on a foundation, but doesn’t require one; the steel I-beam that runs underneath it provides all the support it needs.Once a manufactured home, (almost) always a manufactured home. When shopping for a home, you may see some that have been upgraded and added onto by their owners to the extent that they no longer resemble manufactured homes. Look for two clues: If a house has the steel I-beam running underneath, it’s a manufactured home. Also, homes installed after 1976 have a U.S. Housing and Urban Development plate containing a serial number and date of manufacture affixed to it. Don’t remove that plate; if you do, then try to sell the home, your buyer might not be able to get a loan. The most important thing to know is that manufactured homes are one of the most-affordable kinds of housing in the United States, and the only affordable housing in many rural communities. Rental apartments in New Hampshire currently average $1,206 a month, whereas the average Welcome Home Loan payment on a manufactured home, including taxes and insurance, is $898 a month. Added to that natural affordability, the New Hampshire Community Loan Fund is also offering Your Turn assistance to low-income homebuyers who otherwise can’t afford a down payment and closing costs on a manufactured home. So why not get out of that apartment, and into your own home! Ron Thompson is a Welcome Home Loans Mortgage Loan Originator at the New Hampshire Community Loan Fund. NMLS #225348. Welcome Home Loans carry a fixed interest rate. The current rate is 8.875% (Annual Percentage Rate of 8.953% with a $100,000 loan amount, $5,000 down payment, 30-year term, no points). Your actual rate, payment, and costs could be higher. Get an official loan estimate before choosing a loan.